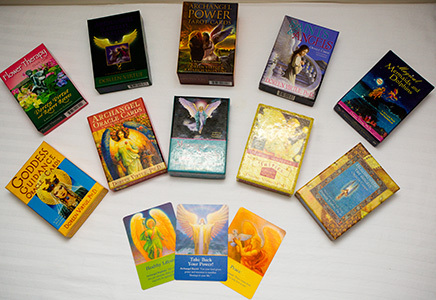 As a certified Angel Intuitive and Light Worker, Carolyn can help bring clarity and healing through oracle card readings. This can be done with numerous different decks of cards depending on your circumstances and requests. Carolyn can conduct spiritual healings both in her clinic and distance healing using a fusion of different tools. She is a Certificate Angel Intuitive and Light Worker. As well as a crystal healer. Using her intuition, by tuning into you, she can determine the best tools and healing methods needed for you at a given time. I went into my session with Carolyn at Empowerkin Kinesiology without expectation and was blown away. When I arrived I had been suffering from a painful hip flexor that caused me to limp and on occasion unable to walk. I had never experience Kinesiology before and wasn’t even sure if it would even improve my hip flexor. Within minutes of Carolyn starting the treatment, I was blown away by how the body works and is connected. Being a personal trainer I understand muscle and movement, but this opened up a whole new level of body connectivity to me. At the end of the session, I felt strong, balanced and connected in a whole new way to my body. I would highly recommend Carolyn and Empowerkin Kinesiology, it was truly an amazing experience. I just wanted to say a huge thankyou to the wonderful Carolyn. Not only were you able to work your magic on me, you were also able to determine exactly what my body needed at any time and work on that area specifically. I always leave feeling physically and spiritually rejuvenated. Your passion for helping others really shines through and I would thoroughly recommend you to anyone who needs a physical and spiritual lift! Thanks again and I will see you soon. I want to say a really big thank you to Carolyn. You have helped me to relieve my lower back pain. After having three pregnancies, I have been suffering from lower back pain. Carolyn helped me strengthen my pelvic floor muscles. I would highly recommend Carolyn to all my friends and family. I found to be very attentive, respectful and professional. A really amazing experience. Thanks again Carolyn. In my Kinesiology sessions with Carolyn, I have found her to be a supportive, professional and knowledgeable practitioner. During our sessions she has been able to tap into issues which have been effecting me for a long time. After our sessions I feel centered, calmer and more in control of my life. Thank you Carolyn. My daughter is 7 years old and has delayed development. Because of this, she struggles with her school work and behaviour and self esteem. My daughter has always about 6 months behind the rest of her class. In working with Empowerkin Kinesiology and Carolyn my daughter has caught up with her reading and is in the middle of her class now. We have less self esteem issues and she has more confidence within herself to take on challenges which most children find easy in which she has struggled with. I would recommend Empowerkin Kinesiology to anyone who is willing to give Kinesiology a go. It has help my daughter in becoming a more confident young girl. I saw Carolyn for help with finding clarity about priorities in my life. I felt pulled in multiple directions which was stressful and draining my energy. After one session I felt calm and content! I had clarity about where I wanted to put my energies. I think I really need kinesiology to stay centered and balanced. I'm looking forward to another session to cement what I gained the first time, or to see where it leads. Thank you Carolyn, after I had struggled with things for months, you made it so simple! Carolyn provided a very professional service at a critical time in my life, having lost my son in an unexpected tragic car accident. Carolyn worked on me and with me to release "whatever" and "clear" my way to move forward. I am extremely thankful we crossed paths. I had the pleasure of having a Skype session with Carolyn. Going into the session I had no idea what Kinesiology was about and how it would assist me. Carolyn took the time to find out what was happening in my life and how she could help me. She offered me some great solutions that are very easy to incorporate into my day without feeling like a burden. Thank you Carolyn. WOW!! My 10 year old son was anxious, wound up and tense. Carolyn helped balance him. My son walks out of a session feeling calm, rejuvenated and optimistic. Carolyn has given my son techniques on how to manage his anxiousness at home. I would highly recommend Carolyn. She made my son feel comfortable in each session. Thank you Carolyn. Please contact Carolyn on 0402 145 342 to make an appointment. Skype sessions are also available. Contact Carolyn for packages available. Want to find out more about Kinesiology? Get my self-care plan and walking meditation for FREE!